The fact is that school success starts at HOME. (Read part 1 in this series here or on my blog at the Lifetime channel.) This is a cross post one week after this part 2 blog appeared on Lifetime last Tuesday. "Oh, Vicki, you don't understand, I have this problem or my child has an LD." Two of my three children have "learning differences" and I refuse to call them disabilities because my children can learn and they are smart - they just learn differently than their classmates. It is my job to help their teachers and to help them see their own genius. Yes, all of my kids are honor roll or headmaster's list and they have worked for every moment. But we haven’t arrived anywhere and this road is paved with sweat, tears,and a whole lot of determination. I’ve gleaned 10 points from my own parenting philosophy and those I’ve seen work as I teach students every day and will continue to share these over the next few posts. Certainly parenting is never this simple as just following 10 points but this can give us talking points from which we can move forward. 1- Let your goal be to help your child learn and find his/her strengths. Be positive. Don’t let your tired-ness at the end of the day prevent you from your most important job: being a parent. Learn how your child learns. Learn about your child’s interest. No guidance counselor can replace a good parent who knows her child. 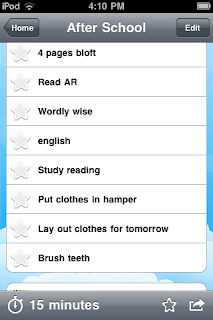 2 - Guide Homework don’t Do Homework. NEVER do their homework FOR them. EVER. Guide them to do their homework so that they can become efficient and successful and so that eventually they don't need you. We help our children but when we do our child’s homework FOR them, we are sending them the message that we think they cannot do it. But when we don’t see that they have a planner then we’re telling them homework isn’t important. Just because your child’s teacher didn’t give a worksheet or report doesn’t mean that your child has no homework. Studying should be a consistent part of their schedule, particularly if your child has a learning disability. 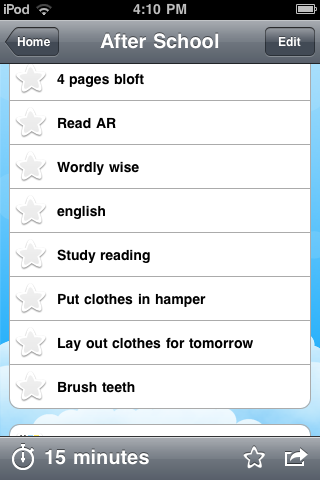 We have the Home Routines app with a daily routine on my son’s iPod touch. (See the routines in the photos.) This lets him own his routine. When I’m struggling with how to help my child learn, I typically research on iear.org (iEducation apps review) or ask my teacher friends on Twitter or the educators on #ipadchat hashtag on Twitter. 3- If you have a problem with a teacher, handle with care, privately. Keep the conversation between you and the teacher if possible. I will not undermine a teacher or principal with my words at home because I know that children do not have filters and my words will be echoed in theirs in the classroom and it will negatively impact their success. Children are mimics. As a teacher, I’ve heard a parent tell me something and heard those same words out of their child’s mouth the next day. If the parent was disrespectful to me and the child echoes the words, it has now become a problem in the classroom. Wise parents help their children stay positive by insulating them from their communications with the teacher. There are also two sides to every story and wise parents know this. And all I ask is a tall ship and a star to steer her by..."
She gave the child a zero only to have the Mom call for a conference. The Mom brought her son, the handwritten poem and herself trouncing into my sister's room and smacked the poem onto my sister's desk like someone playing in the last round of slapjack. "My child wrote this poem and you ARE going to give him credit. Son, tell your teacher who wrote this poem:"
"Me. I wrote it." He mumbled sheepishly. "My son doesn't lie and he wrote this poem. Now what are you going to do about it." My sister got up from her desk, walked over to the corner and quietly slid out a book. She opened to a page with the poem Sea Fever by John Masefield and opened it beside the poem. "If your child wrote this poem he is not only a genius, he is a mind reader because his poem is in this book and was written by John Masefield." "All I know is if he says he wrote it he did, and you should give him credit." The Mom never backed down but my sister never did either. The child kept the zero but was taught by his Mom that it is OK to lie. Children lie. Adults lie. And your children know that the biggest threat to their perceived self-preservation and status quo is if you actually start talking to their teacher. Get both sides of the story before painting yourself in a corner. "If you give me the benefit of the doubt and don't believe everything your child says about me, then I won't believe everything your child says about you. Let's communicate." They are children. Sometimes they are right. Sometimes they are wrong. It is your duty as a parent to do due diligence. I also know that when I continually monopolize an administrator or principal’s time on an ongoing basis that I will become a nuisance and could harm my child in the classroom. I can harm my child if I try to be a guardian angel hovering over my child every moment. I may be a guardian but I'm no angel and I have to let my children learn to live life. You can be an advocate. You can explain without complaining. You can speak out on behalf of your child. When you argue with a teacher it is most often the child who loses. My children aren’t perfect. We’ve had some great teachers and have had some not so great teachers. With my children who have LD’s I’ve had to “go to bat” to get accommodations. There is a balance here. Part 3 of this series will appear on my Lifetime blog sometime today. I do this so some of you may join us over there who are interesting in parenting topics.